Acceleration in outstandings growth. Average outstandings rose 6% y/y in 3Q16 for the 13 issuers in the study; this growth rate marks an increase from previous quarters (3% in 2Q16 and 2% in 1Q16). American Express reported a 14% y/y decline, due to the loss of the Costco and JetBlue portfolios; excluding these portfolios, it grew loans by 11%. Bank of America reported no change in average outstandings, ending a protracted period of loan declines due in large part to divestitures. 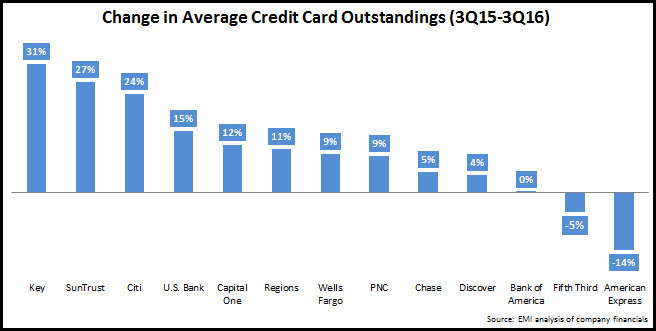 Regional bank card issuers continue to focus their attention on cross-selling credit cards to existing clients. Regions grew outstandings by 11% and reported that its credit card penetration rate rose 130 basis points (bps) y/y to 18.2%. Continued volume growth. EMI analyzed volume data for 8 leading issuers, and found cumulative y/y growth of 9% in 3Q16. American Express’s sale of the Costco card portfolio to Citi led to a 15% decline in its card volume, while Citi’s volume rose by 57%. Issuers are launching new rewards cards and enhancing existing rewards programs to drive additional volume. Discover reported that its rewards costs rose 13% y/y to $368 million in 3Q16, and its rewards rate rose by 13 basis points to 1.20%. However, Discover has been struggling to grow volumes in recent quarter, with y/y growth of just 2% in 3Q16, down from 4% in 1Q16 and 3% in 2Q16. Ramp up of card account production. Related to—and encouraged by—the growth in outstandings, issuers are ramping up new card acquisition. Bank of America issued 1.32 million new U.S. consumer credit cards in 3Q16, the strongest quarterly performance since 2008. Chase benefited from the launch new cards (Sapphire Reserve and Freedom Preferred) to grow new card production 35% y/y to 2.7 million. Chase reported at the BancAnalysts Association of Boston Conference this week that it opened more than 1 million new Freedom Unlimited accounts in the five months following its launch. Issuers are investing more in marketing in order to drive growth. American Express grew its marketing and promotion spend 10% y/y for the first 9 months of the year, to $2.4 billion. Charge-off rates remain very low. For many issuers, net charge-off rates continue to operate at or near historic lows, with seven issuers reporting rates below 3%. There is some evidence of upward movement in charge-off rates as issuers chase growth. 8 of the 12 issuers in the chart below reported y/y rises. And most issuers are reporting y/y rises in 30+ day delinquency rate (which have traditionally been an indicator of future charge-offs). However, issuers expect that rates will not rise significantly in the coming quarters. For example, Chase reported a charge-off rate of 2.51% in 3Q16, and projects that this rate will rise to about 2.75% in 2017. Capital One did report a 66 bps y/y rise in its charge-off rate; this is related to the fact that it is continuing to target low-FICO segments; the <660 FICO score segment accounted for 36% of Capital One’s outstandings at the end of 3Q16, up from 34% at the end of 3Q15. Regional bank card issuers continue to lead in receivables growth. 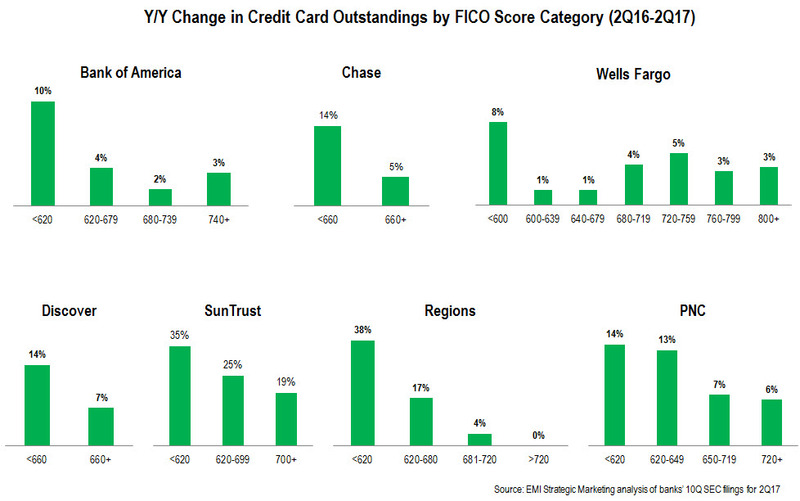 A key factor: regional banks, such as SunTrust and Wells Fargo, are focused on cross-selling credit cards to their bank customers. Many national issuers not (yet) growing loans, but are ramping up new account generation. National credit card issuers like Citi and Bank of America reported y/y loan declines in 3Q15, due to continued run-off of legacy portfolios. However, both of these issuers are confident that their portfolios will grow in the near future. 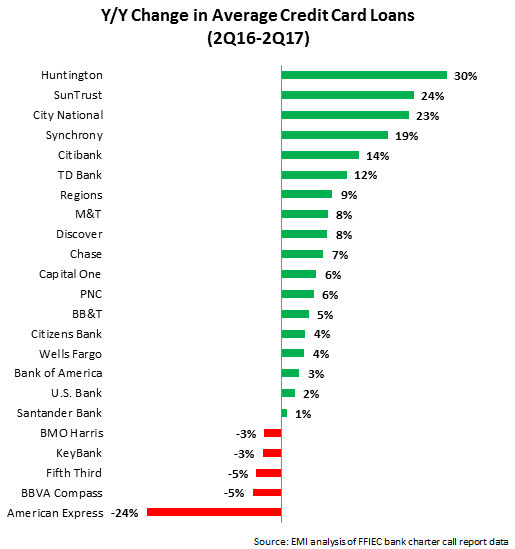 Citi reported that it is ramping up card acquisition for its core products, and this is starting to pay off with 6% y/y rise in active accounts. Credit card “monolines” are also investing in new account generation. Discover new account generation in 3Q15 was at its highest level since 3Q07. And American Express reported an 8% y/y rise in marketing and promotion spending, with a focus on attracting new card members. As a result of this investment, American Express generated 2.3 million new accounts in 3Q15, compared to a quarterly average of 1.6 million in 2014. Card volume grew…but was impacted by low fuel prices. Leading issuers continued to report growth in purchase volume, but the y/y rate of growth was lower than in recent quarters, in large part due to low fuel prices. Discover reported y/y sales volume growth of 2.6%. However, excluding gas, the growth rate was 7%. Issuers reporting very strong volume growth included Capital One (+19% y/y), which is benefitting from its focus on transactors, and Wells Fargo (+15%). Issuers are growing revenues…and expenses. 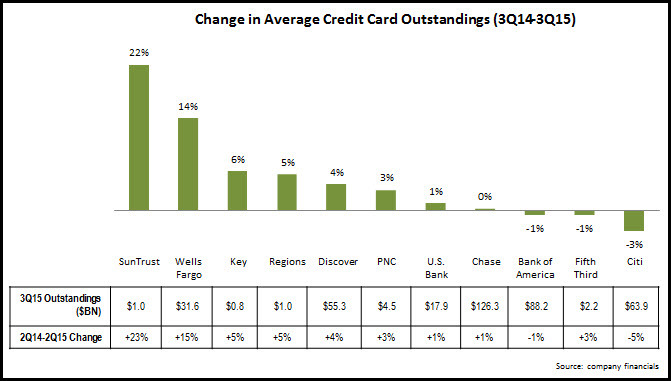 Six of the largest U.S. credit card issuers have dedicated payment units, which publish quarterly revenue and expense data. Since the financial crisis, revenue growth has been elusive for issuers, but in 3Q15 four of the six issuers reported y/y growth in revenue. Benefitting from loan growth, five of the six issuers reported growth in net interest income. And three of the six reported noninterest income growth. However, as issuers are looking to generate new accounts as well as loan and volume growth, they are increasing their noninterest expenses. Banks with the largest y/y increases in noninterest expense in 3Q15 included American Express (+11%), U.S. Bank (+9%) and Discover (+8%). Credit card yield shows signs of growth. Of the seven leading issuers who reported yield data in their quarterly financials, four reported y/y growth. In addition, six of the seven reported q/q rises in yield. This indicates that in the post-CARD Act environment, issuers are not competing aggressively on price, but are instead concentrating on enhancing rewards, providing additional value-added features, and making large acquisition-and-activation bonus offers. 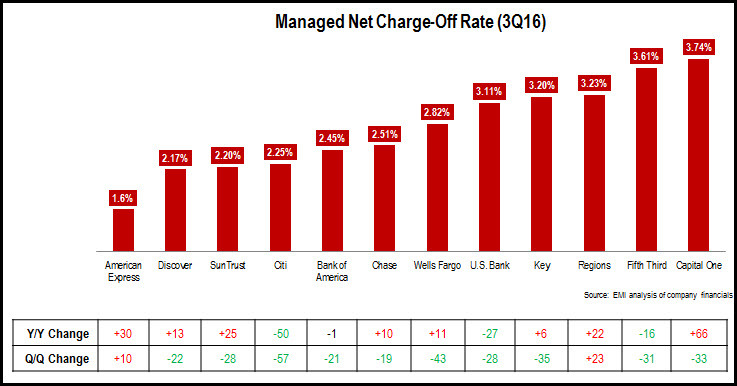 Charge-off rates continue to decline…and may fall even further. 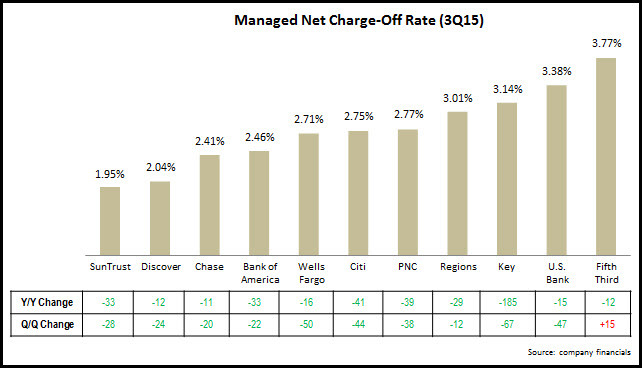 As we have mentioned in previous blogs, credit card net charge-off rates are well below historical averages. Reasons for this extended decline include tight underwriting on the part of issuers and an aversion to building up large credit card debt on the part of cardholders. In its earnings conference call, Discover characterized the credit loss environment as “remarkably benign.” With continued y/y declines in 30+ day delinquency rates (which have historically been a predictor of charge-off rates), issuers are not expecting the charge-off rate to spike in the near term, and in fact rates may continue to decline further.